Sentry Garage Door & Gates is the one-stop shop for all your apartment door and gate needs. We maintain hundreds of apartment gates across Houston and across, so we exactly know how to tackle your gate related problems. Having problems with your apartment gate? Call Us & we will be there fast! Sentry Garage Door & Gates repairs & installs all apartment gates. Same day service! Sentry repairs apartment gates Houston openers. Apartment driveway gate sales, service, & repair. Same day service! Commercial security gate opener repair, service, & installation. Same day! Security is an important consideration for apartment and condominium dwellers. Hence, we provide our clients with the latest and most advanced gates to ensure provide safe and quality living for the residents. 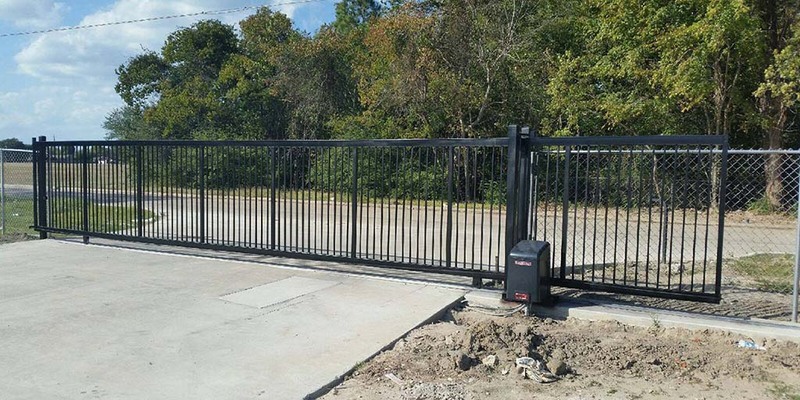 We specialize in all kinds of manual and automated gate systems, so we can provide you with the solutions that are best suited for your specific requirements and budgets. See some of the apartment gate photos then call us. Our goal is to provide our clients with lasting, low maintenance, easy to repair custom apartment gates that ensure peace of mind for those living in the apartment. We understand apartment gates are used extensively, which is why our gates are designed for high volume use and withstand all the abuse. With the right custom apartment gates from Sentry Garage Door & Gates, you can enjoy life without having concerns for security. Browse our collection and let us help you choose the best-suited gate for your apartment. Malfunctioning apartment gates can be a nightmare! But we give you peace of mind with our fast apartment gate repair service. We have fixed all types of gates – ones that are twisted and bent. Or, ones that have been knocked down by drunk drivers and ones that have technical problems. We have extensive experience in repairing all kinds of apartment gates & gate openers, so you can enjoy your cup of hot coffee while we fix the problems. Our team of friendly staffs fixes an appointment with the best technicians who arrive at the location in no time and complete the job affordably and fast. We also offer maintenance services for our clients to ensure the apartment gates work properly and the problems get fixed as soon as they arise. Whether the apartment gate has minor problems or it has stopped working completely. Call our team and restore its functionality right away! Make life easier with apartment gate openers from Sentry Garage Door & Gates. Have complete control over who accesses the premises with a single button. We offer high quality gate openers for apartment gates of all kinds and can be installed on new and existing gates. We offer affordable solutions, and precise installation services along with repair and maintenance for apartment gate openers. However, the beauty of gate openers can quickly fade away when it starts showing signs of problem. Hence, you need to partner with a door and gate service provider that can promptly respond to the situation and get things back on track. Sentry Garage Door & Gates has helped clients across Houston install and maintain gate openers, so you can completely rely on our services. With a BBB A+ rating and impressive customer reviews under our belt, you will find no other door and gate company in Houston that matches our standards. Call us and get an apartment gate repair or new apartment gate estimate today from Sentry Garage Door & Gates.